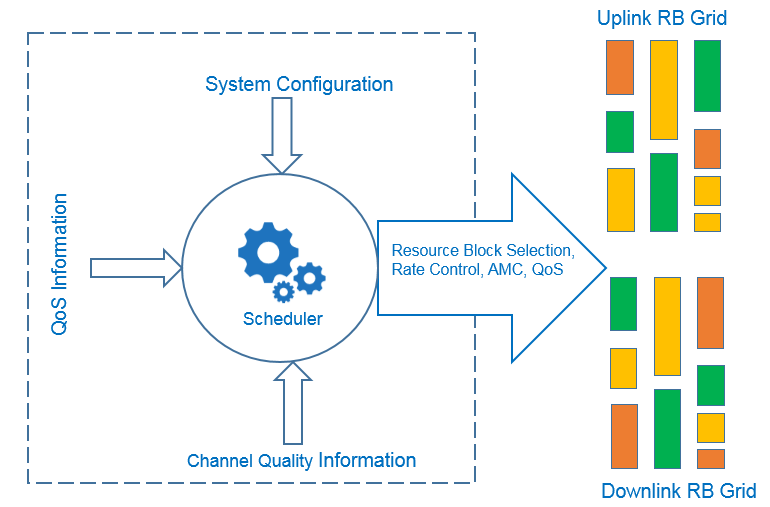 What is a LTE Scheduler ? Scheduling is a process through which eNodeB decides which UEs should be given resources (RBs), how much resource (RBs) should be given to send or receive data .In LTE, scheduling is done at per subframe basis i.e. every 1 mili second. The entity which is govern this is know as scheduler. A scheduler takes input from OAM as system configuration e.g. which scheduling algorithm is to be enable (round robin, Max C/I, Proportional Fair, QoS aware etc), consider QoS information (Which QCI, GBR/N-GBR etc.) and channel quality information (CQI, Rank, SINR etc) to make the decisions. Link Adaptation: It selects the optimal combination of parameters such as modulation, channel Coding & transmit schemes i.e. Transmission Mode (TM1/TM2/TM3/TM4) as a function of the RF conditions. Rate Control: It is in charge of resource allocation among radio bearers of the same UE which are available at the eNB for DL and at the UE for UL. Users (Users in RRC Connected State). Resource Assignment: It allocates air interface resources to selected active users on per TTI basis. the interference to the neighbouring cells. HARQ (ARQ + FEC): It allows recovering from residual errors by link adaptation. Packet error loss rate, etc. Dynamic Scheduling: Every TTI, MAC checks for the UEs to be scheduled, the Data Availability for each UE to be scheduled and the feedback from the UE on the Channel conditions. Based on these data, it can schedule the resources for the UE through the PDCCH. If data is not available, UE will not get scheduled. All Services can be scheduled using Dynamic Scheduling, but at the expense of the Control signalling [PDCCH Usage – a scarce resource]. Persistent Scheduling: In this case, Packets are scheduled on a fixed basis, similar to the Circuit Switched fashion. Here, it does not depend on the Channel Condition. The Resource allocation remains constant for the period of the call. Semi-Persistent Scheduling: It is a Hybrid way of scheduling, which tries to overcome the drawbacks of the Dynamic Scheduling and the Persistent Scheduling. The figure above show conversational voice is considered for persistent scheduling. It is clear that, because of the fixed resource allocation, UE will end up in under utilizing the allocated resources, because of non-availability of the sufficient data during the persistently scheduled TTIs. Here, because the Speaker sometimes speaks and sometimes user may give pauses during the conversation, Voice activity period and Voice Inactivity period exist in the Speech data. 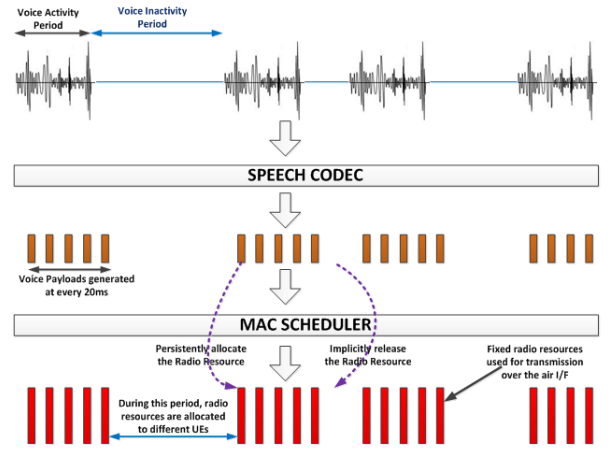 If the Speech Codec without VAD is involved, then it sends the Voice Payload at the end of every voice frame length of 20ms during the Voice activity period and sends nothing during the Voice Inactivity period. 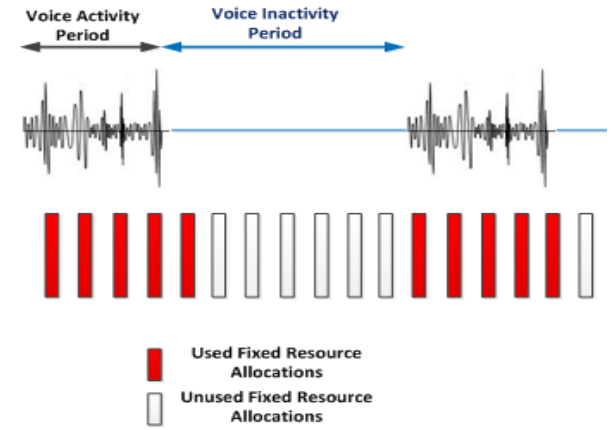 So, the fixed resource allocations will get utilized during the Voice activity periods to transmit the received voice payloads over the air interface and it gets unused during the Voice inactivity periods, which is a critical drawback. Semi persistent scheduling addresses this drawback in a unique way. Round Robin: The RR scheduler selects and schedules UEs in a round robin manner, thereby creating an equal resource share. The disadvantage of this approach is that UEs with sub-optimalCQIs may be allocated Physical Radio Resources (PRBs), thus reducing the overall cell throughput. Max CQI : The max-CQI scheduler selects the schedulable UEs based on the experienced CQI. The UEs with the highest CQI therefore become candidates for scheduling thereby increasing the overall cell throughput. The disadvantage of this approach is that UEs with lower CQI are denied scheduling instances, thus being starved for throughput and leading to degraded user experience. For a Max C/I scheduler, the Sector throughput improves while cell edge throughput drops compared to a PF scheduler where sector throughput may not be as good as Max C/I but cell edge throughput thoroughly improves.